Our extension program is led by Dr. Erin Hodgson, and Dr. O’Neal and many lab members also participate in programs throughout the year. We are focused on delivering research-based information to a variety of clientele. Our group serves farmers, crop consultants, agricultural professionals and other university/extension personnel. Most of our programs are within the state of Iowa, but we travel throughout the Midwest to deliver content. Our program topics are mostly focused on promoting IPM tactics, such as host plant resistance, sampling, economic thresholds, crop rotation and buffer strips. We strive to provide sustainable recommendations so that farmers can reduce production costs but still protect yield. 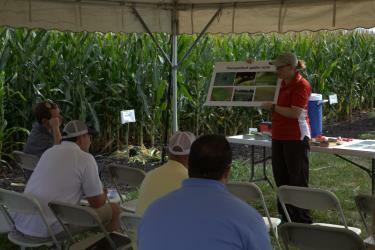 Although most of our extension is soybean insect-related, we are also involved with corn insect management, too. Each year, we speak to about 4,000 people. This includes a combination of field tours and lectures. In addition, we produce a number of publications to aid in IPM for field crops. There are several field guides, compendiums and other resources available to help make timely management decisions in corn and soybean.